In the sunken lands of Arkansas along I-55, there’s a road sign that directs you to a pair of tiny, hardscrabble towns in the Delta. It reads: Marie/Lepanto. 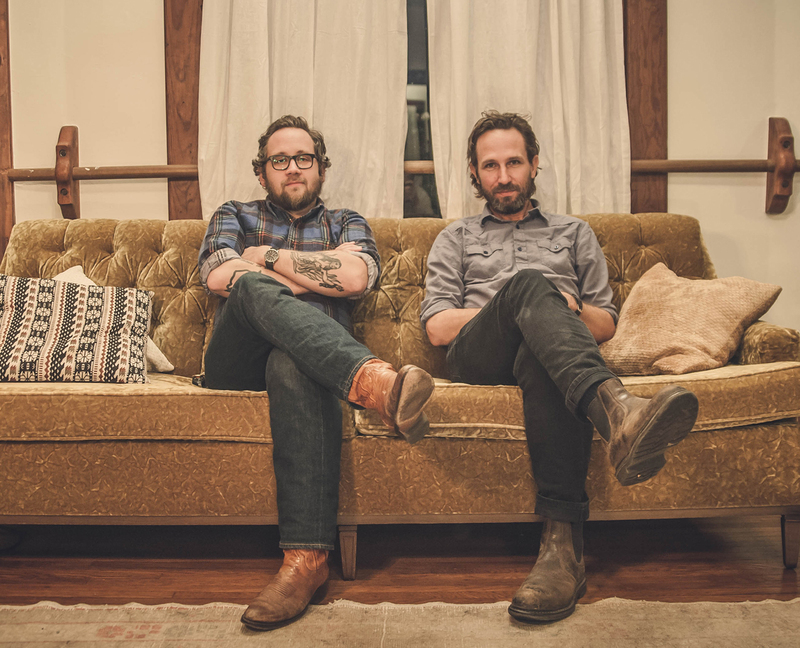 Situated roughly between Southeast Missouri and Western Arkansas — the two points where singer-songwriters Will Johnson and Justin Peter Kinkel-Schuster grew up — that dual appellation seemed a perfect handle for their new collaboration. It’s especially fitting as their debut, Tenkiller, is an album permeated by a sense of place. For Johnson, the veteran singer-songwriter and longtime leader of Centro-matic, his union with Kinkel-Schuster, of Water Liars and Theodore, fits a pattern. In his work with South San Gabriel, Monsters of Folk, and Overseas, collaboration has long been the cornerstone of his creativity. Like his other endeavors, Marie/Lepanto was born out of a musical kinship and personal respect. “I’ve been a huge fan of Will’s writing and singing playing, admired him from a far for a number of years,” says Kinkel-Schuster. That admiration grew closer and became mutual after Water Liars toured with Centro-matic during the band’s farewell run in 2014. “Water Liars kinda became a soundtrack for me during that time,” says Johnson. A couple years later Johnson and Kinkel-Schuster decided to do a joint living room tour of the U.S. They were on the road a week together sharing stories and swapping favorite records. Musically, the duo’s Venn diagram of influences included lost albums like Jim Sullivan’s 1969 curio U.F.O. to the revered catalog of Minneapolis alt-rock scrappers The Replacements. It wasn’t long before the notion of a more serious collaboration was in the air. “I’d already secretly hatched this plan for us to make a record together,” admits Kinkel-Schuster with a laugh. “The trust and respect between us had reached a level where it was kind of a no-brainer,” notes Johnson. The Austin-based Johnson and the Arkansas-based Kinkel-Schuster did just that in the fall of 2016, traveling to the Bluff City to record with Powell, resulting in the 10-track Tenkiller. The intimate sessions found Johnson and Kinkel-Schuster sharing writing, playing and vocal duties, yielding an album that falls in the great tradition of indie rock team ups – from Nikki Sudden and Dave Kusworth to Vic Chesnutt and Lambchop, Peter Buck and Kevn Kinney to Kim Gordon and Lydia Lunch. Nearly every aspect of Tenkiller seemed to be affected by that notion of place, starting with the studio itself. Opened in September 1960, Sam Phillips Recording is like some strange, magnificent dream: a mélange of jet-age technology, pyramid facades and pastel-colored walls, all sprung from its creator’s fevered imagination. Tenkiller evinces both the individual identity of its authors, as well as the alchemy of their union. The haunting harmonies of opener “Patient Man” ushers in an album of beautiful laments and finely-etched narratives. Offering a darker more austere vision of Americana, the record moves between the widescreen majesty of the waltzing “High Desert,” the discordant guitar crunch of “Inverness” and the meditative melancholy of “Rest Be Mine” with a seamless grace. Marie/Lepanto will be out in support of Tenkiller, beginning in early 2018, with Johnson and Kinkel-Schuster touring in a two-man configuration. “We’ll start with just us and see who we pick up along the way,” jokes Johnson.